The Government's back with its third crack at cleaning up the stain on New Zealand's reputation caused by misuse of the Financial Service Providers Register (FSPR), acknowledging the idea of scrapping the FSPR altogether has been floated. Minister of Commerce and Consumer Affairs Paul Goldsmith told interest.co.nz scrapping the FSPR has been raised as a possibility. "But the advice I've had so far has indicated there is still use in having it. So the task really is to ensure that it is only those who are genuinely providing financial services in New Zealand that are able to use it," Goldsmith said.  otherwise required to be licensed under any other NZ legislation. This, the Government says, will make it harder for entities that do not have a real connection with NZ to register on the FSPR, and therefore reduce their ability to create a false impression that they are licensed or actively regulated in NZ. The review of misuse of the FSPR comes as part of a broader government review of the Financial Advisers Act and the Financial Service Providers Act. The Government plans to introduce a Bill to Parliament at the end of 2016 covering off a range of changes. Currently a firm can register on the FSPR if it has a place of business in NZ, regardless of where in the world the financial service is provided. MBIE points out firms misusing the FSPR often set up a superficial operation in NZ by leasing an office and employing a person to provide back-office services. These firms register to provide financial services that don't require licensing in NZ, such as foreign exchange services. And nor is there pre-vetting by a regulator. They don't offer financial services within NZ, but can use their NZ registration overseas to give a false impression that they are regulated in NZ and trade off the country's good reputation. "Registration on the FSPR allows these firms to misrepresent to overseas customers that they are licensed or actively regulated in New Zealand, and enables them to enjoy a lesser degree of scrutiny overseas than might otherwise be the case," MBIE says. "The public often interprets 'registration' on the FSPR to mean that an entity is actively regulated in New Zealand." "The Financial Markets Authority (FMA) receives large volumes of complaints from persons outside New Zealand, relating to offshore-controlled firms registered on the FSPR which have not paid out customer funds when required to." As one critic of NZ's FSPR puts it ; "You're giving drivers licences to people who can go and drive anywhere in the world apart from New Zealand and cause whatever carnage and crashes, but it's not your remit, you don't care." 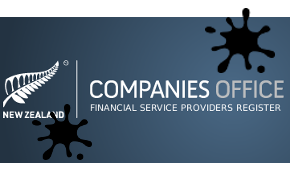 Last year MBIE said  whilst this misuse of the FSPR may not have an impact on NZ businesses or consumers directly, as these dishonest overseas financial service providers typically avoid offering services to New Zealanders, "it creates a risk to both NZ's reputation as a well-regulated jurisdiction and to the reputation of legitimate New Zealand financial service providers." Since December 2010 anyone providing a financial service, such as insurers, banks, lenders and financial advisers, has been required to be registered on the FSPR, operated by the Companies Office. The qualification requirements for registration are similar to those for a director of a NZ company, including not being an undischarged bankrupt or convicted of a crime involving dishonesty in the previous five years. The FSPR - effectively similar to a telephone directory - records the name, address and financial dispute resolution service membership of the provider, along with the services it's registered to provide and any licences it may have. There are currently about 13,000 financial service providers registered on the FSPR. MBIE points out other similar jurisdictions don't have the type of problem NZ has, or at least not to the same extent, because typically they licence all types of financial service providers. "For example, in Australia all entities that provide financial services are required to obtain an Australian Financial Service Licence. New Zealand does not license all financial service providers because licensing can impose significant costs, create a barrier to entry and reduce competition in the market," MBIE says. Goldsmith said other complementary measures that could help address misuse of the FSPR are also on the table. These include more stringent requirements for those registering on the FSPR such as requiring applicants to provide information showing they are licensed and/or supervised in their home jurisdiction before they can register, and prohibiting firms from referring to their NZ registered status in any offshore advertising. MBIE will consider these measures and report back to Cabinet in September. Goldsmith's announcement of the planned changes comes after MBIE issued an options paper last year providing six options on how to tackle misuse of the FSPR . The FSPR came out of a 2006 government review of financial products and providers  that recommended the introduction of a comprehensive register of financial service providers. This was designed to achieve a range of outcomes including allowing for more effective monitoring and evaluation of the financial system, and satisfying NZ’s international obligations under the Financial Action Task Force (FATF) recommendations requiring the licencing or registration of all financial institutions to ensure effective monitoring of anti-money laundering and countering terrorist financing obligations. Since the FSPR was established in 2010 the FMA has rolled out a range of licensing regimes  for financial service providers, and NZ's Anti-Money Laundering and Countering Financing of Terrorism Act (AML/CFT Act) took effect in 2013 . However, the Government says the FSPR is still needed because it satisfies NZ’s international obligations under the FATF recommendations on combating money laundering and the financing of terrorism. Access to information on the FSPR also has other benefits, the Government says, such as allowing the public to check whether an entity is complying with its obligations to be registered on the FSPR, and to check a registered entity’s dispute resolution scheme. Previously the Government moved to toughen company registration rules through the Companies and Limited Partnerships Amendment Act 2014, initially in response to problematic shell companies  like SP Trading. These changes  included making all companies have one or more directors resident in NZ or Australia who can be held to account if necessary. Goldsmith said the Government had been watching the issues around the FSPR closely. He said tightening the requirements around NZ directors had an impact, as did giving the FMA deregistration powers. "The previous changes to the law have made a big step, and so the proposal here is to go a bit further," said Goldsmith, adding the Government was "trying to improve the ability of our regulators to effectively deal with the register so we don't have that reputational risk to the country." "It will be more robust, and the key thing is to ensure the regulators have the tools in their toolkit that can deal with inappropriate behaviour. We've given them some in the previous round of changes and we're proposing to give them some more," added Goldsmith. Goldsmith said there was no link between the FSPR review and the planned introduction of the so-called phase two of the AML/CFT Act that's being overseen by Minister of Justice Amy Adams. "There's no direct link to the AML phase two work which Amy Adams is working on. She's looking at the AML side of the equation. This is really just dealing directly with the Financial Service Providers Act. If that comes up in the course of discussions, that could be considered part of her look at the AML phase two work," said Goldsmith. In a statement the FMA said changes to the FSPR will help address the misuse of the register by offshore companies with little or no connection to NZ, that are registering to take advantage of NZ’s good reputation and to give the impression they are regulated or licensed here. "The FMA supports the introduction of new legislation in line with the Minister’s recommendations."